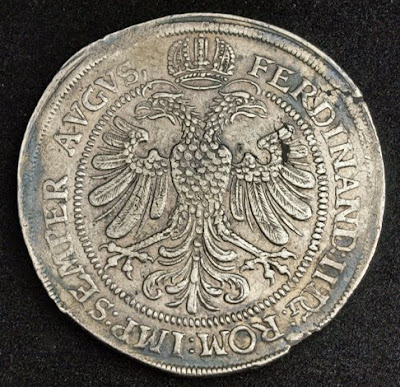 German States Coins - Free Imperial City of Nuremberg - Silver Thaler Mint year 1637 - Ferdinand II, Holy Roman Emperor. Obverse: Coat of arms of Holy Roman Empire above, between arms of Nurnberg below. Date (1637) in fields. Reverse: Imperial crown above nimbate double-headed imperial eagle. Reference: Davenport 5648, Kellner 242, KM-94. R! German Coins, German coinage, German silver coins, German States Coins, Coins of Germany, German Gold Coins, German commemorative coins, German Imperial Coins, Numismatic Collection, Coins of the German Empire, Coins of Germany best silver coins for investment, silver coins, German East Africa coins, old coins, coin collecting, rare coins, world coins, foreign coins, heritage coins, silver ira investment, silver bullion coins, silver coin collection investors, investment coins, antique coins, Unique Silver Coins, collectible coins, Münzen Deutschland, silbermünzen, Münzen aus Deutschland, Münzen Deutsches Kaiserreich. 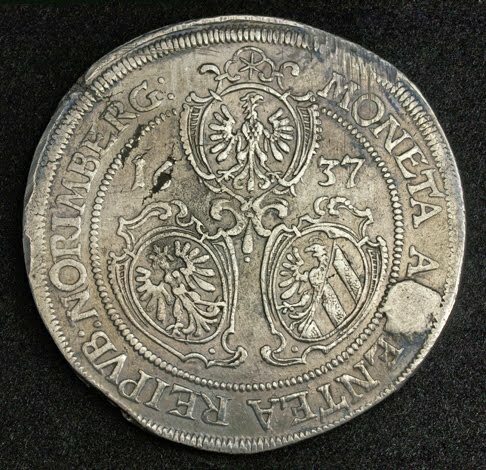 The Free Imperial City of Nuremberg (German: Reichsstadt Nürnberg) was a free imperial city — independent city-state — within the Holy Roman Empire. After Nuremberg gained piecemeal independence from the Burgraviate of Nuremberg in the High Middle Ages and considerable territory from Bavaria in the Landshut War of Succession, it grew to become one of the largest and most important Imperial cities, the 'unofficial capital' of the Empire, particularly because Imperial Diets (Reichstage) and courts met at Nuremberg Castle. The Diets of Nuremberg were an important part of the administrative structure of the Empire. The Golden Bull of 1356, issued by Emperor Charles IV (reigned 1346–78), named Nuremberg as the city where newly elected kings of Germany must hold their first Imperial Diet, making Nuremberg one of the three highest cities of the Empire. The cultural flowering of Nuremberg in the 15th and 16th centuries made it the center of the German Renaissance. Increased trade routes elsewhere and the ravages of the major European wars of the 17th and 18th centuries caused the city to decline and incur sizeable debts, resulting in the city's absorption into the new Kingdom of Bavaria on the signing of the Confederation of the Rhine in 1806, becoming one of the many territorial casualties of Napoleon's Great French War in a period known as the German Mediatisation.